Published: April 12, 2013 at 03:00 a.m. Updated: April 22, 2013 at 12:15 p.m. In the days leading up to the 2013 NFL Draft, NFL.com will allow users to determine the best and worst draft picks for every team. The series continues with the team that owns the No. 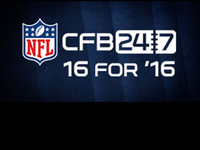 27 overall pick in this year's draft, the Houston Texans. Football games are won in the treches, and every team wishes they had a mauler in the trenches like Duane Brown. 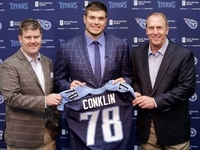 The fifth-year veteran out of Virginia Tech has grown into one of the best offensive tackles in the NFL, and was recognized as such by earning first-team All-Pro honors in 2012. 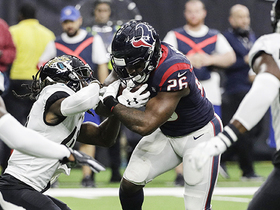 Brown has helped move heaven and earth to pave the way for Arian Foster's three straight 1,200-plus yard rushing seasons, while protecting quarterback Matt Schaub's blind-side. Brown recently signed a six-year contract extension, which means Schaub, Foster and the Texans' faithful can sleep a little easier at night knowing this great draft pick isn't going anywhere. If the David Carr experiment was ever going to work for the Texans, they needed to (a) protect him better and (b) give him offensive weapons. Grabbing receiver Andre Johnson in the franchise's second-ever draft was a great start, and had he not been the third-overall pick he would have made this list. 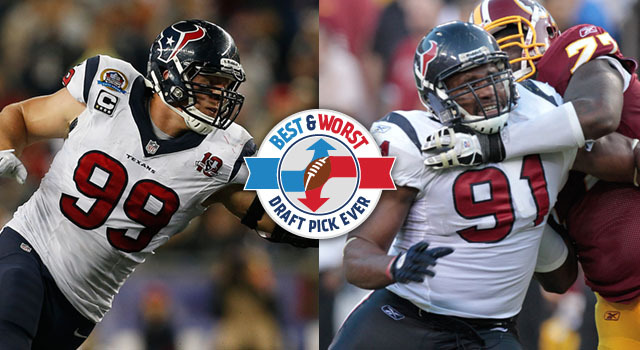 During their first four years of existence, the Texans lacked a viable threat at tight end until they found Daniels at the top of the fourth round in 2006. The sure-handed Wisconsin product is adept at exploiting the middle of the field and is a bruising blocker to boot. 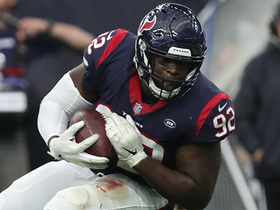 Daniels is a perfect complement to the tandem of Foster and Johnson in the Texans' offense of today, making his selection all the more valuable. The 2006 NFL Draft was quite fruitful for the Texans, even if they've lost a few of those picks to free agency or trades over the years. In addition to Daniels, one of the better selections was linebacker DeMeco Ryans out of Alabama at the beginning of the second round. Ryans anchored the center of the Texans' defense for years before the next player on this list came into the fold. While with the Texans, Ryans was the Defensive Rookie of the Year, a two-time Pro Bowler and an All-Pro. Ryans had four straight seasons with over 100 combined tackles, and was a crucial in helping them evolve from a perennial cellar dweller into a competitive franchise before being traded to the Philadelphia Eagles after the 2011 season. The Texans originally drafted Cushing as an outside linebacker and he went to the Pro Bowl in his rookie season playing on the edge. When defensive coordinator Wade Phillips came to town in 2011, Cushing made the switch to the inside and thrived. 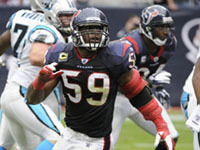 He was a second team All-Pro, and helped lead the Texans to their first playoff appearance and win in franchise history. Cushing is the heart and soul of the Texans' defense, and the unit isn't the same without him. From 2011 to 2012 with Cushing in the lineup, the Texans only allowed one team to score more than 30 points against them. 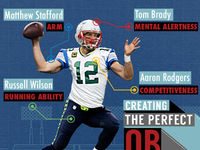 Without Cushing? Four teams scored over 30 in only 11 games. He's a game-changer when on the field, and even though you'd expect that from a top-15 pick, Cushing is and will continue to to be a cornerstone for the franchise as long as he's wearing the steel blue and battle red. 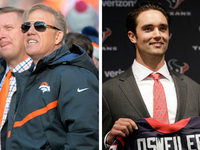 Is a two-year stint in the NFL too small of a sample size to truly evaluate a draft pick? Absolutely. But when said pick has evolved into one of the most dominant defensive players in the NFL in those two years, jumping to conclusions is a little more palatable. A former walk-on at Wisconsin, Watt has a relentless motor and can take over a game completely. He can rush the passer, stuff the run and disrupt passes through the air as well as many cornerbacks in the league. Watt was a playmaker in his rookie season, and took his game to the next level by pacing the NFL in sacks at 20.5 and earning Defensive Player of the Year honors. Th Texans' recent ability to draft well in the first round is the reason they are now an AFC power instead of an AFC afterthought, and why so many of their first-rounders made this list. Carr was the first draft selection in Texans history. Things started great, as Carr led the Texans to a win over the in-state rival Dallas Cowboys in their inaugural game (becoming just the second NFL expansion team to win their first game, joining the 1961 Minnesota Vikings). It went downhill from there. 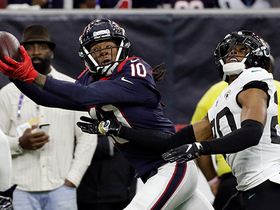 Carr was a punching bag in the pocket as the expansion Texans failed to fix a wreck of an offensive line. Carr was sacked a staggering 76 times in his rookie season (that's an NFL record). In five seasons with the Texans, Carr was sacked 249 times (leading the NFL three times, with two of his season totals among the three worst in league history). In 2007, the Texans moved on from Carr and opted to trade for Schaub. Rarely, unless the talent is spectacular, does a team use a high pick in the supplemental draft. Using a second-round pick on a player who spent two years as a defensive back at Georgia Tech and played only four games at running back in college before blowing out his anterior cruciate ligament and lateral meniscus? Questionable decision-making at best. Hollings started one game in the NFL, ending his career with 149 rushing yards and as many touchdowns as me. 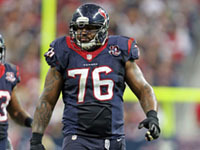 The Texans traded down three spots to select Johnson in what turned out to be a very weak draft for defensive tackles. Johnson ended up being a serviceable backup defensive lineman for the Texans. That's a big problem when you throw down a top-half-of-the-first-round selection on a player. 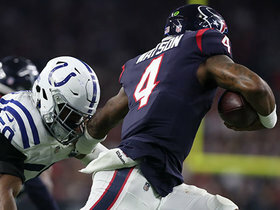 Johnson started just 38 games over four years for Houston, registering two sacks. In 2009, Johnson was traded to the San Diego Chargers for a late-round pick, a common and unceremonious end for a draft bust. If you're a tight end drafted before Jason Witten, you better produce. Unfortunately for Joppru, injuries derailed any hope he had at a successful NFL career. As a rookie, a groin injury suffered in training camp ended his season. The following year, another groin injury left him watching from the sidelines. If you guessed he missed his third year with a groin injury, you'd only be partially incorrect -- it was a torn ACL that cost him the 2005 season. He managed to make it through the 2006 summer intact, but he was released after Week 5. He recorded no stats in his NFL career. The Texans drafted the 19 year old with the 10th pick in 2007. Worse than his production in Houston -- 11.0 sacks in four years -- is who came after Okoye that year. The next four picks -- Patrick Willis (11), Marshawn Lynch (12), Adam Carriker (13), and Darrelle Revis (14). That'll leave a bad taste in anyone's mouth.